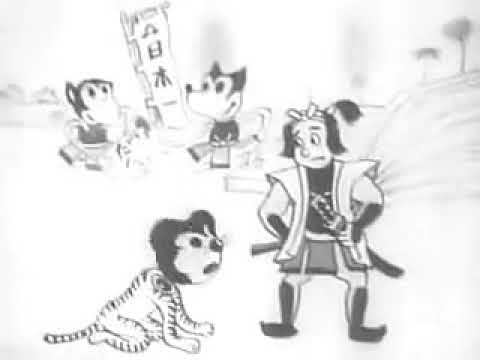 "Toybox Series 3: Picture Book 1936" (1934) - Omochabako series dai san wa: Ehon senkya-hyakusanja-rokunen (meaning "Toybox Series 3: Picture Book 1936") directed by Komatsuzawa Hajime. This Japanese film was made in 1934, but the story takes place in 1936, possibly because the Naval Treaty between the U.S.A. and Japan expires that year. Tensions between the two countries were high already, as Japan was invading China and the U.S. put up sanctions to convince the Japanese to stop their aggression. The Japanese government used propaganda to convince the Japanese people the Americans were evil and they were trying to defend themselves. In 1934, this film was made with characters depicting dolls and cats (even a copy of Felix the Cat) on a peaceful island in the pacific. One day, an evil Mickey Mouse appeared flying on a bat and soon more Mickeys appeared, along with snakes and crocodiles. The frightened locals opened a book asking Momotaro, Kintaro, Issun-boshi, Benkei and other folklore characters of Japan to drive the attackers away. The culture icons fight each other till Momotaro defeats Mickey Mouse and peace is restored to the island. The ending scene shows cherries blossoming and the characters dance.